Psychologists have determined that a child’s brain development is influenced significantly when a child acts on or manipulates the world around him or her. Puzzles provide that key opportunity. Children learn to work directly with their environment and change its shape and appearance when they work with puzzles. When children flip, turn, remove, etc. pieces of the puzzle, they are learning the connection between their hands and their eyes. The eyes see the puzzle, and the brain then envisions how the puzzle needs to look or what piece needs to be found and placed. Then the brain, eyes, and hands work together to find the piece, manipulate it accordingly, and fit it into the puzzle accurately. For babies and young children, gross motor skills can be enhanced with stacking blocks and other large, easily-manipulated puzzles. The skill of effective problem solving is a valuable and important one. As a child looks at various pieces and figures out where they fit or don’t fit, he or she is developing this vital skill. A puzzle, after all, can’t be completed by cheating! It either works and fits or it doesn’t. So puzzles teach children to use their own minds to figure out how to solve problems and think in a logical way. For young children – even babies – learning to recognize and sort shapes is an important part of their development. Puzzles can help little ones with this, since the pieces need to be recognized and sorted before they can be assembled. Simple jigsaws and other types of puzzles may help enhance a child’s memory. For example, a child will need to recall the size, color and shape of various pieces as he or she works through the puzzle. If a piece doesn’t fit, the child sets it aside; but he or she will need to remember that piece when it is needed. 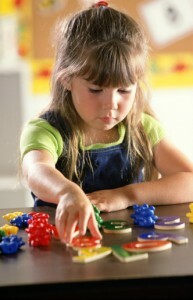 As a child works on a puzzle, he or she will often develop a strategy to work the puzzle faster and more efficiently. He or she may do all the edge pieces first, for instance, or sort all the pieces into piles according to colors or shapes. This helps a child learn to achieve small goals as a means toward a larger goal.